Opening at Tuggeranong Arts Centre, Krapp’s Last Tapeis one of Samuel Beckett’s more well-known plays. Sitting, as I am, and contemplating what I want to say about Krapp’s Last Tape, I think about commenting on the set, the actor’s performance, the lighting, the direction; but all of that seems to undermine this play. This is a story about a man who made a decision decades ago, and whose existence is not haunted, but shaped by the consequences of that decision. And nothing matters more than that character. Of course, the design elements have to be properly balanced, or the character won’t be visible. Ian Croker’s set, Jack Lloyd’s lighting, and Len Power’s sound design are as important as Graham Robertson’s performance, but all of these must be properly balanced, and nod gently to the presence of Beckett’s ‘hero’. I think this is the great strength of this production. All of these design elements are indeed balanced perfectly, giving the audience perfect access to the character. I had read Krapp’s Last Tape many years ago, and enjoyed it at the time. Like any of Beckett’s work, it is difficult to read, but it absolutely sings when a performer embodies it. Graham Robertson is a veteran of the Canberra stage, and as one would expect, he brings Beckett’s miserable Krapp to life. His engrossing performance is punctuated with perfect delivery of Beckett’s dry humour. 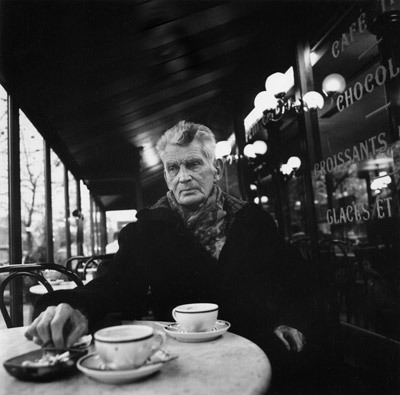 I will argue to my dying day that the use of the word ‘absurd’ to describe Beckett’s world view is absurd. He is a logician, and his work epitomises logic. It might baffle a person who tries to read it, but in performance Beckett’s work is simplicity itself. And Krapp is a superb example of Beckett’s magnificent capacity to tell a story. Nothing beats that.